Pulverize graham crackers in food processor to fine crumbs. Combine with sugar & melted butter. Press into the bottom of a 9′ springform pan. Bake at 350 for 10 minutes. Cream cream cheese, peanut butter, & sugar until fluffy. Scrape down sides of bowl. Add in flour. Scrape down sides of bowl. Add eggs, one at a time, until well blended. Scrape down sides of bowl. Add heavy cream, until well blended. Scrape down sides of bowl. Bake at 450 for 10 minutes. Reduce heat to 250 & cook for 60-75 minutes or until set. Cool for 10-15 minutes. 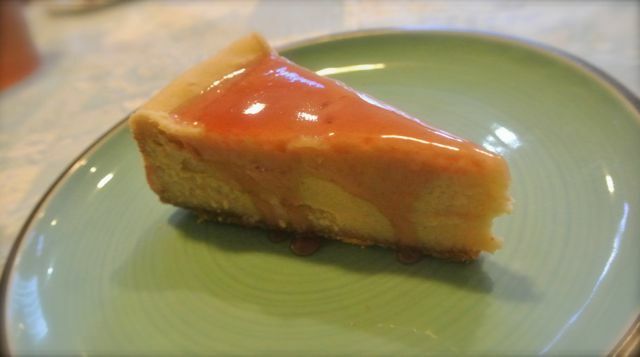 Gently slide a table knife around the cheesecake to loosen. Loosen ring of the springform, but do not remove. Allow to cool for another 45 minutes to an hour. Remove ring. Place in a pie or cake keeper. Chill. Spread 1/2-3/4 cup jelly on top before serving.